King Solomon’s proverbs on wise living are peppered with images from nature, as he uses animals, weather and other natural things to illustrate his sayings about justice, wisdom and prudence. “Go to the ant, o sluggard,” he says in the famous Proverbs 6:6. Today’s real estate investors are learning the value of looking to the environment and nature for ways to save money. Energy efficient and environmentally friendly upgrades and add-ons can boost a home’s selling price and attract good renters. But paying for those green upgrades and getting a return on the investment can be tricky – especially when solar energy is involved. 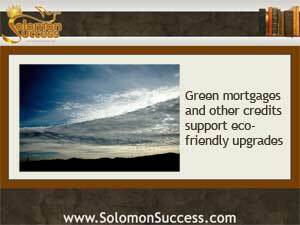 Tax credits, government energy subsidies and even green mortgages can help. Upgrades to make a property more energy efficient or environmentally sensitive, such as installing double paned windows, replacing insulation and ductwork, or converting to solar heating can be deducted from taxes as part of the long list of deductions and credits for repairs, maintenance and renovation available to property owners. Some, for repairs such a replacing a broken window with a more energy efficient version, can be deducted immediately, while others, such as installing a new roof, may be amortized over the life of the investment. But virtually any repair or upgrade can qualify for a deduction under the current, owner friendly tax code.